What you see before you is a combination of genius, luck, and sheer awesomeness! lol. 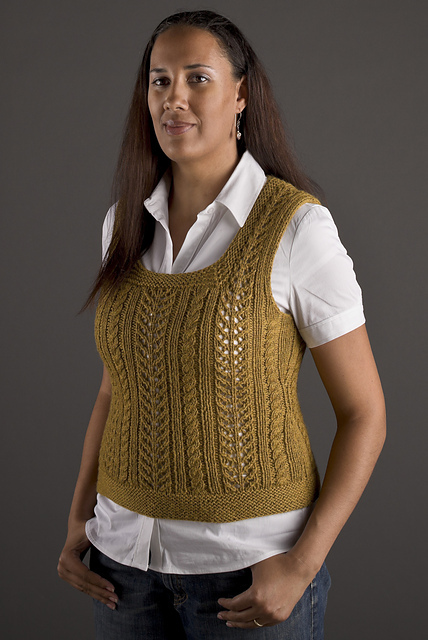 Well, actually, it's just a simple pull-over vest that I knit from a single skein of Cascade Yarns Eco Plus in the best color ever...straw. I've been in love with this color for ever and I've wanted to use it but if I let that beautiful golden-yellow anywhere near my face, I look like I have jaundace. My compromise...go with a vest so I can put a white shirt between me and it. Awesome! 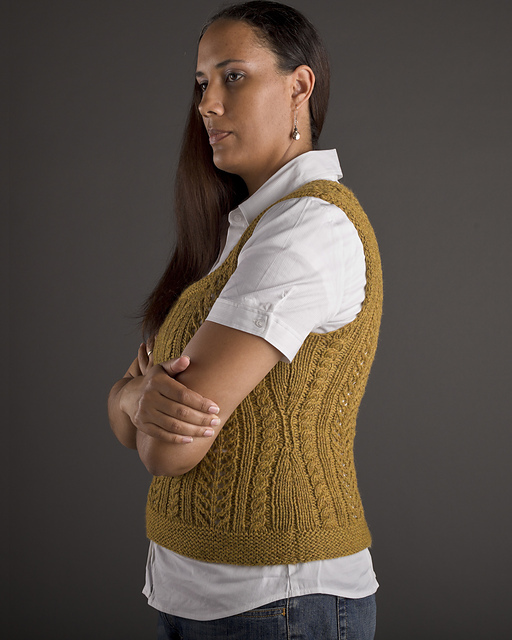 This project was kept super-secret for the entire month that I spent working on it because I had intended to submit it to Knitty with hopes that they would select it for their First Fall 2012 edition but at the end of the day, I just loved it too much to send it away. 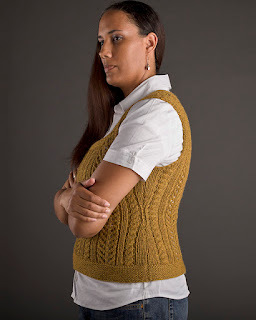 So I'm keeping it for myself and I'm going to release it as part of my indi-pattern collection. It needs a name and some editing, but other wise it's ready to go. Now, see these beautiful photos in crisp, lifelike color? My friend Heather's husband is a professor of photography at RISD and he let me come into their studio and shot photos of this piece (as well as both Apogee sweaters) to repay me for a very small favor I did a year or so ago (which was completely unnecessary by the way, but who am I to look a gift horse in the mouth). While we were there taking pictures and Steve and Heather were doing their best not to make fun of my 'angry-face' (I'd just yelled at the teenager on my way out the door...), we got to talking about the programs offered at RISD and Steve started encouraging me to make a few calls and think about enrolling in their design program. I was like "sure. that would be cool" and he was like "no really. I'm serious" and I was like "but I'm going after a masters in psychology" and then "do you think they'd take my BS in psychology to get into their master's program?" and then "wow...maybe I could actually do this". Can you believe that?! But in my defense, when a professor of one of the world's best art schools tells you that you've got talent and should apply to the school, you sort of have to take him seriously (at least for a minute). That being said, I've made a few calls and done some research online and while I still need to talk to some people about the different programs offered and which one might be best for what I'm doing...I think that I'm going to take a break from psychology and see if I can actually make a go of art school. I've always wanted to pursue art and I've always had to push it aside for academic pursuits like advanced English, management courses, and other such things only to be left unfulfilled at the end of the day. That hole was filled by my job as a manicurist for several years but I eventually had to give that up, which is right about the time I picked up knitting and never looked back. Now I have another shot at it and I'm thinking that I can put that master's degree in psychology on hold for a little bit and just go for it. After all, I'm really green and who knows what I could do with a background in apparel design! So more news on that as it comes. Meanwhile, back at the ranch: the super-secret project is on it's way to the publisher and I emailed them the pattern documents yesterday (totally a week ahead of the deadline, I might add!) so I find myself without any knitting pressure and it feels strange. However, I am sort of on an editing deadline and I got the first of my Apogee patterns back from editing (the 2nd round) and started on that last night. Lots of little things but not many major things so I guess it wasn't as painful as I first thought. Expensive, but worth every penny in the end as it will result in a quality pattern that will earn me a good reputation among knitters as someone who takes care in how their patterns are written. Happy customers are repeat customers, and good editors are worth their weight in gold! Yes yes yes! Go for the art school! I think that's an AMAZING idea! This is obviously your true love and talent.